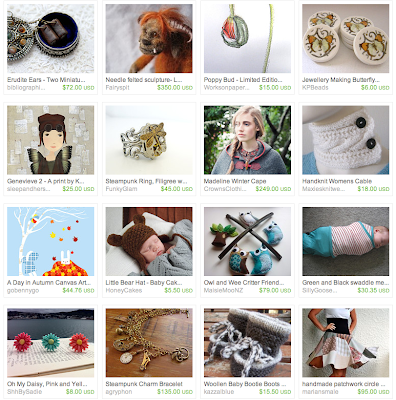 New Zealand Handmade: Buy Handmade! Americans just celebrated their annual holiday of family, friends, love and gratitude - Thanksgiving. Then they entered into the frenzied holiday shopping season with Black Friday, a day when most mass retailers offer discount prices. The focus on shopping has grown to such an extent that there's now a backlash brewing, and there were calls advocating for the Friday after Thanksgiving to be Don't Buy Anything Day. Which then developed it's own backlash. The alternative suggested? Buy Handmade Day! This one I can get behind. The day has passed, but it's not too late to buy a special, original, unique, handmade item for your loved ones for the holidays. To make your shopping easier, I've created this Etsy Treasury with all the items being my our New Zealand Handmade members. Check it out! The circle skirt is fabulous!